1. Durrow. South Side. Detail of Shaft. 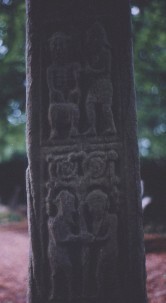 This is a detail of the south side of the shaft of the cross at Durrow, Co. Offaly. It is a close up of two panels S1 and S2 both Old Testament scenes from the Book of Genesis. S2 Cain slays Abel Old Testament. Book of Genesis 4:8.